Jimmy, my brother, installs stamped concrete walkways, so I finally asked him to do one outside my basement door. Then I told him how I’d like to have him build me a huge planter box below the deck. I gabbed about how cement is so popular these days, even running inside to show him photos from a Martha Stewart magazine issue showing cement outdoor tables and more. Anyhow, he knows I get nutty about these dreams of mine, but he said we could do it. He agreed on my dimensions, and the cement planter resulted in a 5 x 10 size. After it was completed, which was last fall, I filled it with the soil from my disassembled container gardens from that season. 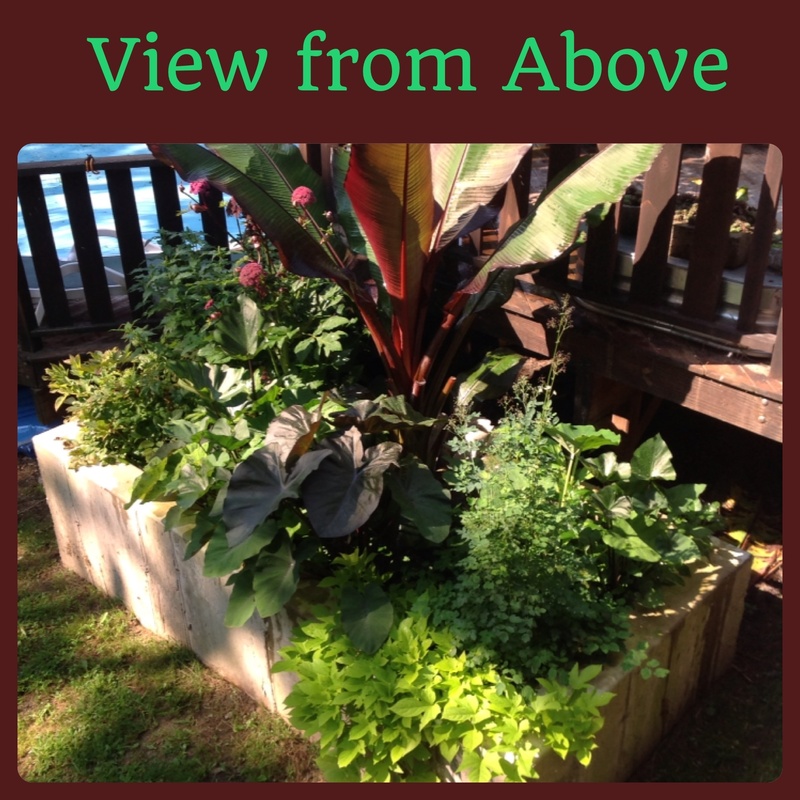 It was perfect because the cement planter is below my deck, so it was easy to dump the soil into it from above. Plus, I was recycling my soil. Then I put a big plywood board over it for the winter. It ended up serving as a useful table during my winter Kissing Ball and Evergreen Creations class. Alas, it came time to plant it this year. 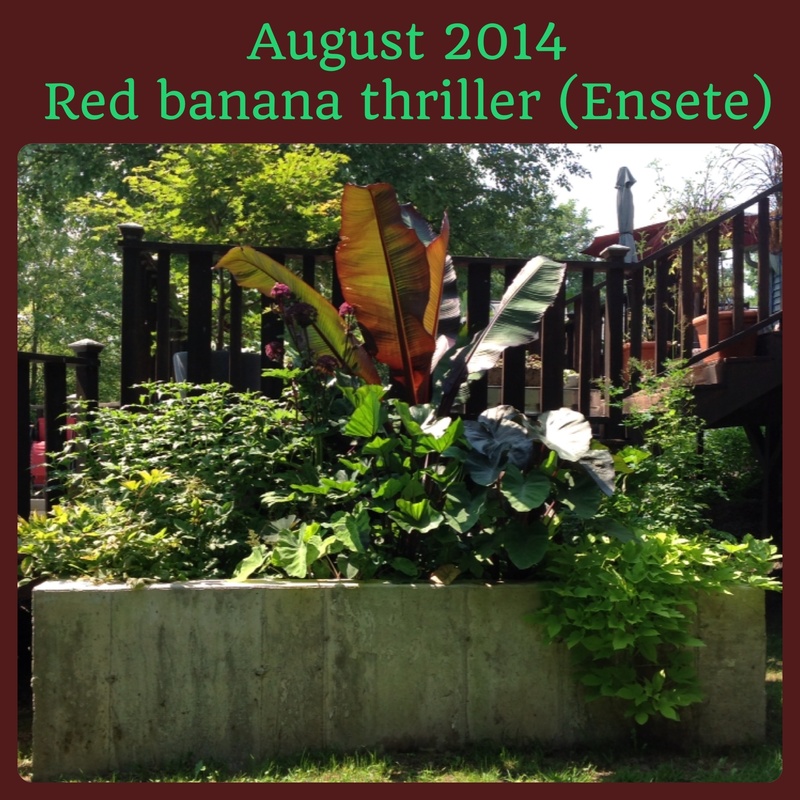 First, of course, was my red banana plant, as the thriller. I imagined the leaves would pop up to the deck railing levels by summer. As of today, the leaves are 52″ long. Yup, I measured it. In warmer zones, the Ensete red banana can reach 12′ tall. In prior years, this tropical plant, Ensete ventricosum ‘Maurelii’ has grown tall in my patio pots and containers, reaching probably 5-6 feet tall, but never has it grown as wide and large as it has in my cement planter. 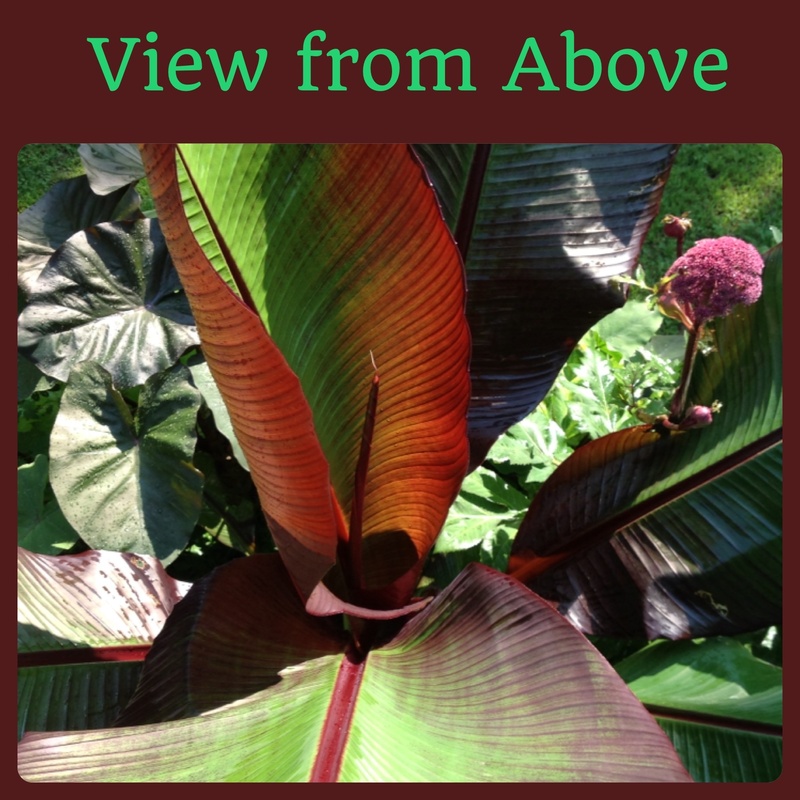 The red banana plants features are thrilling to me because its large reddish leaves grow fast from a thick trunk base. The leaves come up like rolled cigars which is appealing. Then they quickly unroll to show a big tropical look. 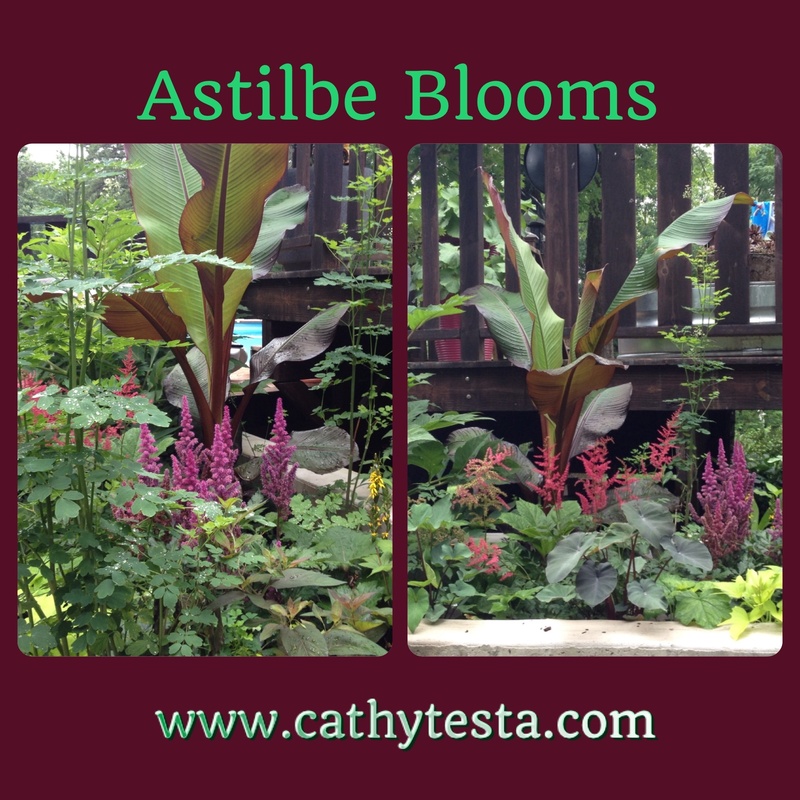 This tropical plant is hardy to zones 9-10 so I had stored the base carefully last fall to reuse as an annual here in CT.
Watering the red banana and its companion plants was no problem either. I just showered them from above when I walked around with my light weight garden hose to do the pots on my deck. The only trouble experienced was the bothersome Japanese beetles earlier in the summer munching on the leaves. Cutting off the unsightly leaves was the solution for more would arise. ‘Maui Magic’ elephant ears are a fav. Its purplish stems and large leaves in a clump are spectacular. ‘Tea Cup’ elephant ears have cupped leaves. Water droplets sit in the center and bobble around as a breeze comes by, or my cat. My cats like to lick the droplets sometimes, and once I found one cat sleeping under the plants in this planter. 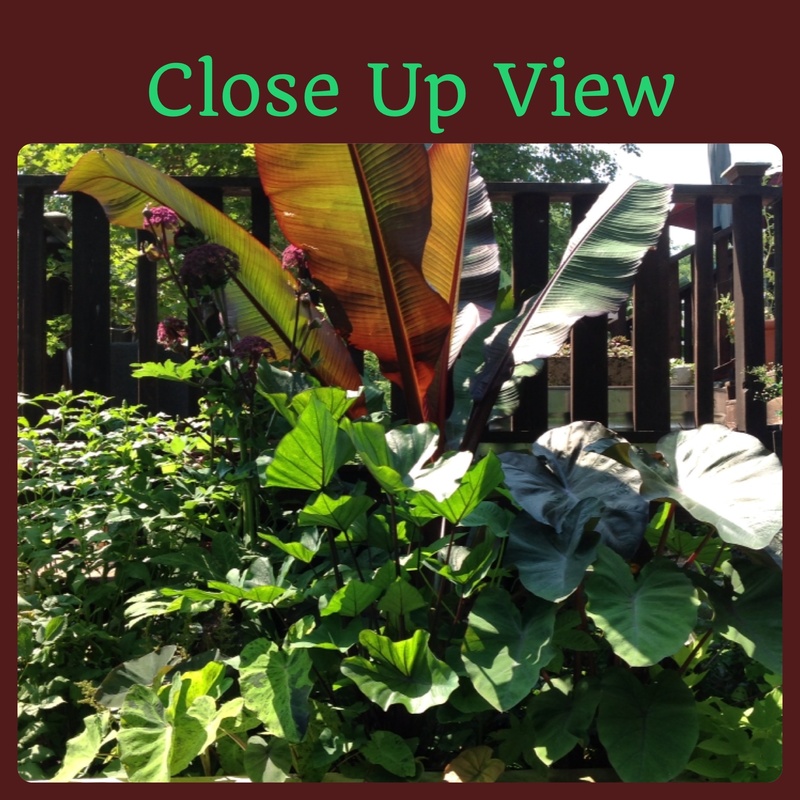 They were reaping the benefits of cool shade from the large red banana plant’s leaves and the elephant ears, plus the monster cement planter is in a quiet location where they can rest or sleep. 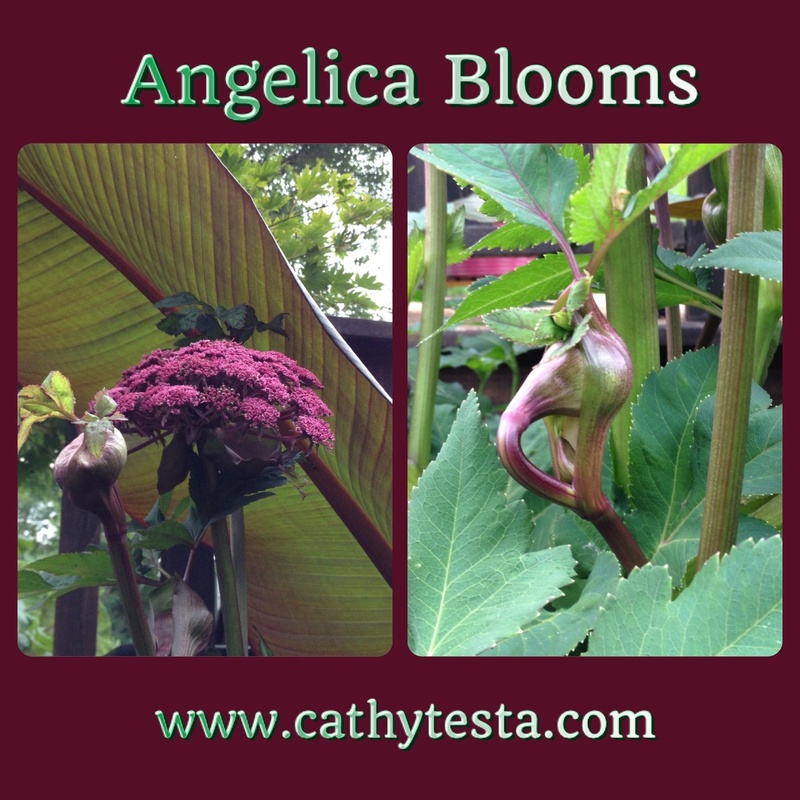 Another plant added was Angelica, selected because it has unusual looking flowers. 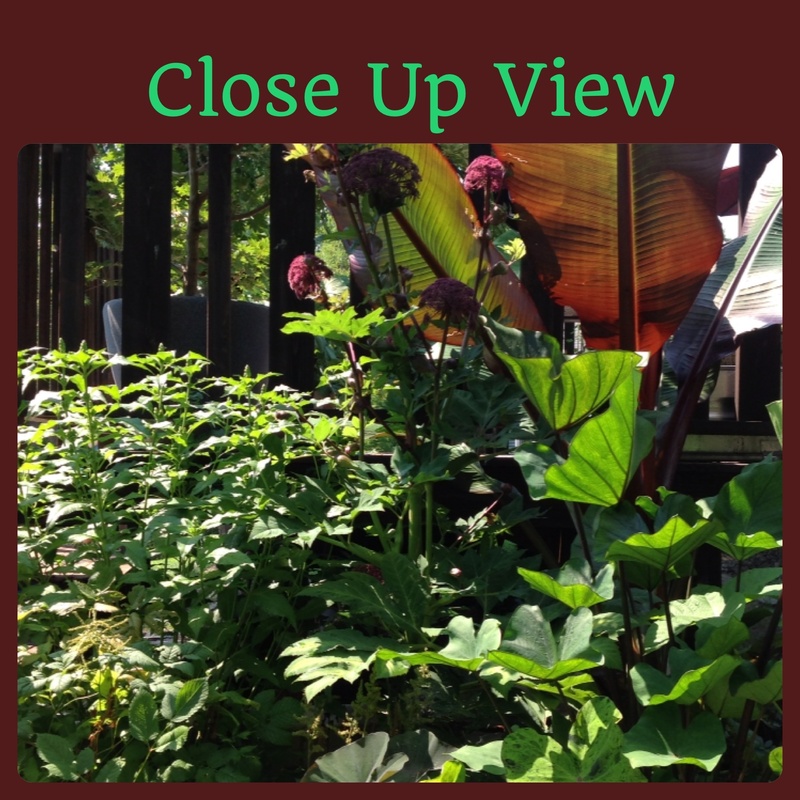 It is a biennial, and also has large foliage resembling giant parsley. The blooms, shaped like pods, first arrived mid summer and are open now. Bees are really enjoying them. I was excited about this plant too because it grows very tall, up to 5-8 feet. The deep plum flowers are a nice color combo next to the reddish banana leaves. Next to bloom will be the pink Turtlehead perennial. Latin name is Chelone lyonii. This will bloom any day now, and more bees will follow. I had this perennial in a pot last year, and loved it. Its a late summer bloomer, and will continue until early fall, plus it also gets large. Its on the left corner with dark green leaves, dense, and packed in nicely. It likes consistently moist soils, and so does the Angelica and tropicals in this monster cement planter. There are other beauties in the planter, such as Rodgersia pinnata and Thalictrum aquilegifolium (Columbine Meadow Rue). The Meadow Rue is the only perennial relocated from a former garden mowed down. It gets very tall, 2-3 feet, and has wispy pale tiny flowers in late spring to early summer. It has more of a woodland feel but the height factor made it a companion. And of course, no container garden would be complete without a spiller, sweet potatoe vine on the corner. Planting this monster cement planter has been easy and a joy. No bending to the ground, or weeding. They can not get in practically, not just because the plantings are full, but the height of the planter helps to prevent them from creeping in. I’d rather plant hundreds of these types of large cement planters over gardens in the ground any day. Now if I could just convince my brother to build me more! That is a beautiful container and I love the lush foliage! NICE! Wow-that’s a MONSTER planter but you put wonderful foliage in it creating such beauty, it is literally Beauty and the Beast, right there outside your basement door! Love your description, Beauty and the Beast! A friend told me, she didn’t get it when the planter was empty–but now she does! Thank u. Thank you Michelle! I’m a little addicted to tropicals, Cathy T.